Apple has enabled turn-by-turn navigation feature for India. Users can now use the voice navigation feature on their iOS and macOS devices, as well as in their cars using CarPlay. 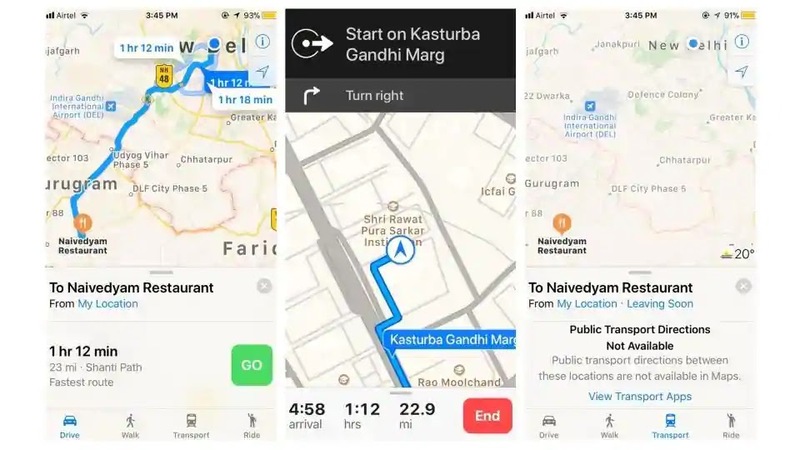 Turn-by-turn navigation has been a major missing piece of the puzzle ever since the service went live in India back in 2012. The initial release did not even show directions for many years, and only had the most rudimentary mapping data. While the mapping data improved over the years, with many of the establishments, businesses, and important locations now being marked on the map, at least in the big cities, and even directions showing up eventually, turn-by-turn navigation was still missing. As of this week, the feature has been enabled and works as well as you'd expect it to from Apple Maps. It's still pretty rough a lot of the routes are not at all ideal or even viable at times, so it's best not to rely on it completely. However, the feature should improve as more and more people use it. With turn-by-turn navigation, you also get cab service integration. If you enter the location you want to head to, the app will show you rides from popular cab services such as Uber and Ola, with the different fare prices. If you click on the app icon, it will open that app with the destination entered and ready to go. I couldn't get Uber to show its rides within Apple Maps but Ola seemed to work fine. What's missing still is transport information, so you can't find out how to reach a place using the bus or the train. There's also no Flyover support yet, a feature which shows a 3D view of the area. However, this is not a particularly important feature. The feature has been live for a few days now and requires no update from the user.